CPSIA - Happy Pool and Spa Safety Week! Happy Pool and Spa Safety Week! The CPSC this week strode bravely forth to combat pool fatalities in the United States - finally. I have written about swimming pool deaths in the past (as early as May 26, 2009 in this blog and earlier in letters to Congress). They are shocking in number. The CPSC says that deaths in pools and spas AVERAGE 385 children per year from, 2005-1007. Of this average, 299 victims were (on average) YOUNGER THAN FIVE YEARS OLD. The childhood pool injury count is even more breathtaking. For pools, submersion injuries requiring emergency room treatment averages 4,200 children per year (47% were for two- and three-year-olds), or 46,200 projected submersion injuries to go with the projected 4,235 childhood drowning deaths over 11 years. There are no phthalates injuries on record. The CPSIA addressed pool safety. A highly-publicized section of the CPSIA is known as the Virginia Graeme Baker Pool And Spa Safety Act (the "Baker Act"). This law was implemented in response to the tragic pool drain entrapment death of the granddaughter of former Secretary of State James Baker. The CPSC cites 11 fatalities from pool drain entrapment from 1999-2008. Over 11 years, at this rate, 12 pool drain entrapment deaths would be projected. The Baker Act dictates that pools replace their drain covers to avoid this awful risk. Not an unreasonable approach to a completely avoidable source of injury, at a relatively low cost. Good idea. It is, however, apparent that the Baker Act does not address the overall massive risk of childhood pool drownings. Of the projected 4,235 deaths in an 11-year period, the Baker Act addresses the cause of only 12 deaths. That leaves the projected deaths of 4,223 children completely unaddressed by our ever-vigilant Congress. Remember, according to my analysis, compliance costs for the CPSIA are about $10,000 per dollar of avoided lead injury costs. Each death is valued at $6.1 million using EPA estimates. The projected unaddressed pool drownings have a "cost" of $6.1 million x 4,223 = $25.8 Billion over 11 years. At the same rate of compliance costs incurred by the lucky companies attempting to comply with the lead rules, the pool industry would have to spend $10,000 per dollar of injury cost over 11 years, or a mere $257.6 trillion. At this rate of spend, the industry would only have to spend $23.4 trillion per annum which happens to be nearly double the projected 2010 U.S. GDP of $14.8 trillion. And how did our Congress respond to the threat of childhood pool drownings? Surely they really threw the book at this terrible problem - it is literally thousands of times worse than lead. Ummm, well, they mandated a public awareness campaign (see Section 1407 of the Baker Act). The CPSC blitz is the effort to comply with this master plan: a press release, a new website and a "a first-of-its-kind national public education effort". Apparently, all you need is a few ads and press releases to solve pool deaths. Strangely, the CPSC is straying from their newly-adopted precautionary principles in this blitz. They actually recommend a strategy of "staying close, being alert, and watching children at the pool". Huh, you've got to be kidding! That sounds a lot like individual responsibility. The CPSC even refers to the need for a "personal system of safety". Being a good parent and keeping an eye on your kids is so "Old School". I assumed that the CPSC had moved beyond such shallow advice. They would certainly never do that for lead. Of course not. I should note that I have long considered the effort to combat pool deaths to be long overdue, so don't get me wrong. I think it's great that the CPSC is actually doing something. Pool deaths claim WAY too many kids' lives every year - we need to take a real threat like this very seriously. But please pardon my waves of nausea over the proportionality of the response. Pool deaths are expected to exceed 4,000 over 11 years (including more than 3,000 kids under five), and in response the CPSC puts up a new website and produces public service announcements with Olympic swimmers. Lead deaths are expected to be one or zero in the next 11 years - and we have to spend $5.6 billion every year in compliance costs. This is terrible government in its purest form. It is indefensible and incomprehensible. I defy the Democrats to stand up and actually defend their policy positions or legislative solutions. They won't debate the issue because it's a total loser for them. The children's product industry is collateral damage to the Dems' reelection campaigns. Well, I won't just grin and bear it. Falling on the sword for their ridiculous sound bites and reelection posturing is not how I plan to go out. This is un-American. Happy Pool and Spa Safety Week. There is something you can do to help raise awareness of the ills of the CPSIA - post the 60 Minutes segment "Phthalates: Are They Safe?" in your blog or on your Facebook page or other social media pages. You can also tweet links to this content. You can lift the "embedding" links needed to place the videos from my blog. Alternatively, you can always go to the 60 Minutes website and take links from there. We need to ring bells loudly about this segment. A nationally-prominent news outlet has finally decided to look at the issues of the CPSIA unemotionally and objectively. The more people that see this segment, the better! CPSIA - 60 Minutes Transcript of "Phthalates: Are They Safe?" The transcript of yesterday's segment on phthalates may be found at this link. The 60 Minutes report notes increased incidents of hypospadias, a birth defect affecting male sexual organs. Certain studies have linked this defect to phthalates, fanning the fears responsible for the noxious CPSIA. In the segment, a Dr. Howard Snyder of the The Children's Hospital in Philadelphia cites a "three-fold increase" in hypospadias in live male births in the last "30-40 years". Dr. Snyder "suspects" that phthalates is the "something" that is interfering in the womb with the production of testosterone leading to hypospadias. He highlights studies that "seem to point to" phthalates as the cause of low sperm counts and other ills in adult males. Thus, the link to hypospadias, or so he says. You will be interested to know that one of the four authors of the Journal of Urology study is Dr. Sarah Lambert - of The Children's Hospital in Philadelphia, apparently one of Dr. Snyder's co-workers. Dr. Snyder seems to have overlooked some of these points. The author of the study goes on to point out the obvious: "'Environmental chemicals need to be regulated,' says Dr. Fisch, 'but policies should be based on science, not fear.'" What, is he crazy? Who ever heard of regulating based on SCIENCE, NOT FEAR?! Some people . . . . Memo to Senators Feinstein and Boxer: Given the fear that the increasing age of birth mothers today may be linked to rising birth defects, perhaps you should regulate when mothers can conceive children. This would be yet another great regulatory innovation from California. Groundbreaking! Anyone think that's too much government intrusion? Mr. Orwell, any thoughts? Darn, we all threw out our copies of "1984" because we couldn't be sure they were produced with lead-free ink. This makes my head hurt. Wouldn't it just be easier to drive the children's product industry into bankruptcy? That's probably a better way to deal with hypospadias. CPSIA - 60 Minutes 5-23-10 Segment Video "Phthalates: Are They Safe?" I wanted to let you know that I will be featured as part of a 60 Minutes segment on the Consumer Product Safety Improvement Act of 2008 (CPSIA) phthalates ban. The segment will air this Sunday (May 23) on CBS and is entitled "Are They Safe?". If you miss it, you can watch it later on the 60 Minutes website. This is a very important development in our continuing effort to force change in the CPSIA. 60 Minutes is the number one news program in the world and one of the most watched programs in the United States of any kind. My interview was filmed last September at Learning Resources' office. I was interviewed by Lesley Stahl for this feature. We have not seen the segment yet (we will see it when you see it). We are hopeful that 60 Minutes will draw attention to the doubtful and wasteful impact of this law on law-abiding companies like ours. Get the popcorn ready - we're going to have an interesting Sunday evening this week! CPSIA - At First, I Thought The Onion Was Trying to be Funny. . . . I think this is a parody, not a real news report. At least I think so. . . . 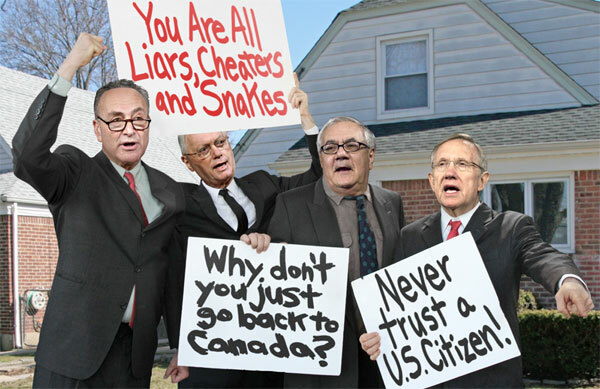 Senators protest against a public they say has become too bloated to efficiently populate the country. The CPSC is on the hot seat over its testing and certification stay . . . again. As you may recall, the CPSC first postponed mandatory testing just ahead of its scheduled implementation in February 2009. On January 30, 2009, the Commission acted to push out the effectiveness of the CPSIA testing and certification requirement by one year, to February 10, 2010. Then-Acting Chairman Nancy Nord noted that the stay "provides breathing space to get in place some of the rules needed for implementation". Robert Adler: "While I had originally hoped the Commission and the marketplace would both be prepared for the lifting of this stay of enforcement, after thorough consultation with CPSC staff and stakeholders in both industry and the public health community, I believe an extension of another six months is necessary to permit market adjustments, especially with respect to the testing and certification by the suppliers of components. I respectfully disagree, however, with my colleagues who have chosen to extend the stay beyond August 10, 2010. While there will be some disruption in the marketplace no matter which date is chosen, no hard evidence has been brought to my attention that would require an even longer extension of this stay than two years from the passage of this landmark legislation. I recognize that others feel differently." More recently, the HTA sent a letter to the House Energy and Commerce Committee stating: "Finally, we hope to settle any confusion regarding our intent in endorsing the CPSEA. We endorsed it as our only available alternative. We truly believe that many of our members will be forced out of business after February 10, 2011 without meaningful, clear reform provided by your committee. . . . You hold the livelihoods of hundreds of small businesses in your hands." Not surprisingly, there is mounting background pressure on the CPSC to push out the testing stay for another year. Nevertheless, I surmise that Dems on the Commission would rather eat dirt (40 ppm lead) than take this step. They invested a lot of political capital in the last stay extension, and despite the promulgation of (literally) reams of regulations, still haven't put in place a workable regulatory scheme yet. Retailers are telling the CPSC privately that without prompt relief from the CPSC or Congress, they are going to have to start turning the screws on their suppliers as though the stay won't be lifted. Hmmm. The pressure is building, building. It doesn't help that Waxman and his supporters won't budge an inch on their proposed CPSIA amendment. By moving in a pack led by Waxman, the Dems are collectively taking full ownership of the awful consequences of the law. And what if the Commission capitulates and extends the stay? That's good for the industry and the HTA, certainly, but it's political suicide for the Dems. They face a real Hobson's Choice. If the stay is extended, it will be taken as an admission that the CPSIA simply cannot be implemented. That would really stick it to Mr. Waxman, patron of the Dems on the Commission. After all, if the law isn't "ready" for full implementation for FOUR YEARS, it's logical to conclude the CPSIA won't ever work, that it was fundamentally flawed from the beginning. [Where have I heard that before???] If the Commission declines to extend the stay, manufacturers and retailers will light the world afire over the pain and losses being foisted needlessly on them. HTA members and other small businesses will start to close down. Ugly. The choice is lose-lose. The stakes are even higher for the Dems, if you take into account Mr. Waxman's REAL baby, TSCA reform. The Dems have a big target in mind, the "reform" of chemical regulation in this country. Put simply, they want to roll out CPSIA-style regulation to all things chemical, including plastics and all mixtures of chemicals. This scares a lot of people, given the permi-chaos dogging CPSIA precautionary regulation of only two substances (lead and phthalates). Arguably, the CPSIA was just a trial balloon for TSCA reform. Ramp up the CPSIA by 30,000 times and you have TSCA reform. If the Dems give an inch on the CPSIA, they fear their hopes for TSCA reform will go down the drain. The children's product industry is caught in the middle of a historic fight over how we Americans regulate ourselves. If you are frustrated by the stalemate over the Waxman Amendment, I think you need to keep an eye on the testing stay. Every day that passes, the pressure mounts on the Waxmanis and the Commission. What's the right thing to do? They sweat and they sweat . . . while we roast. I have previously reported that my study of reported lead recalls over the past 11 years shows that there has been ONE reported death, the widely-discussed Jarnell Brown who died after swallowing a lead jewelry charm in Minnesota. This single death, plus three injuries, is the entire database of injuries reported by the CPSC from lead and lead-in-paint in the past 11 years. That's it. The New York Times reported on Sunday that data from the EPA sets the economic "value" of a human life at $6.1 million. Whether that number is high or low, it's a good placeholder for an economic analysis of the CPSIA. [The EPA originally set this figure for an economic analysis of one of its rules.] According to federal rules governing regulations issued by the EPA, the benefits of a regulation must outweigh its costs. Therefore, as the NYT reports, if you save one life (worth $6.1 million) with a new regulation that imposes a compliance cost of $8 million, the regulation is illegal and must be withdrawn. I wonder if this analysis would give us any insights into the CPSIA. . . .
Another relevant data point from the NYT article is that one IQ point lost to lead poisoning is worth $8,346 over a lifetime. That's a real figure - think of the cost and disruption imposed on the children's product industry to avoid the POSSIBILITY of the loss of an IQ point. Consider that the CPSC has reported three injuries from lead-in-paint in 11 years - that's 3 x $8,346 = $25,038 in "damages" in lost IQ points or a little over $2,200 per year. On the basis of this very doubtful data, my entire industry has been trashed. Let's do the math on the CPSIA: In 11 years, one death ($6.1 million) and three IQ points ($25,000) = total cost $6.1 million. On other side of the ledger, the HTA estimates that the ANNUAL cost to test products for compliance with the CPSIA is $5.63 billion. The all-in cost is probably higher by a factor of 2-3x, but the HTA number is fine for illustration purposes. At this rate, ignoring the likely impact of inflation, the 11-year projected cost to comply with the CPSIA would be not less than $61.9 BILLION. Spend $61.9 billion, save $6.1 million. In other words, thanks to the wondrous CPSIA, Americans spend $10,000 on "safety" to save a buck in injury costs. This is the legislative scheme that your Congressional Dem leaders have been fighting tooth-and-nail to preserve intact for the last two years. The Dems want you to spend $10,000 to save a dollar. They won't give an inch and have stubbornly refused to listen to reason for two years. The illegality and remarkable fiscal irresponsibility of this regulatory scheme doesn't impress them. They tell us there's no safe level for lead . . . but the real danger appears to be that there is no safe level of Democrats in our government. November, November. Mr. Waxman, go ahead and fiddle while Rome burns. We'll see you and your colleagues in the voting booth. "Due to certain procedural steps we are required to take under our statute, there may be delays in providing the records. Please be assured that every effort is being made to process each request as equitably as possible, and that the records or information that you have requested will be made available to you at the earliest possible date." My request relates to pending legislation currently under consideration in the U.S. House of Representatives. As such, the request is both relevant to the development of this legislation and rather time-sensitive. The public has a right to know about these documents. Disclosure of these documents is in the public's interest - transparency in how we are governed is a paramount interest of U.S. citizens. The disclosure of these documents are very relevant to the development of the Consumer Product Safety Enhancement Act, the subject of a recent hearing by a subcommittee of the House Committee on Energy and Commerce. I testified at that hearing. Notwithstanding the assertion in the April 1 letter above, the requested documents have not been disclosed yet. This is especially disappointing as the documents involved in this request are few, easily-located and in the possession of very few, easily-identified people at the CPSC. The effort to gather, review, redact (if necessary, which seems unlikely), duplicate and transmit these documents is almost certainly inconsequential. I find the delay inexplicable and inexcusable under your statute. I urge you to rapidly comply with this request for disclosure. As I noted in my original request, your agency's rules demand it - "disclosure is the rule and withholding is the exception." CPSIA - What is a "Substantial Product Hazard"? How does the CPSC decide which items to recall and which ones to permit to remain in the market? The basis for a CPSC recall is found in Section 15(c) and 15(d) of the Consumer Product Safety Act. The CPSC is only entitled to recall items which present a "substantial product hazard", defined in section 15(a) in relevant part as: "a product defect which (because of the pattern of defect, the number of defective products distributed in commerce, the severity of the risk, or otherwise) creates a substantial risk of injury to the public." Can the CPSC designate anything it wants as a "substantial product hazard"? Not in my opinion, if this legal standard is to have any meaning. Some things are substantial product hazards, and some things are lesser hazards. Those lesser hazards may still be of concern to the CPSC, but the agency lacks the legal authority to order their recall. Other solutions, such as public warnings or voluntary action by the industry, can appropriately address less severe risks adequately. And if you can go this far, why must the abuse or inappropriate behavior even have to take place? Why not recall items just because you can imagine an injury occurring from an abuse that may have never happened? Is that a "substantial product hazard"? Is this pure fantasy or could recalls occur on this basis? Read on. When there are injuries to kids, emotions run high, and the "substantial product hazard" standard expands. Add in newspaper headlines, and anything seems possible nowadays. Let's not forget that in the last eleven years, there has been ONE death from lead, when a four year old swallowed a lead jewelry charm - and, BINGO, we were gifted the CPSIA as a result. The law gives a lot of wiggle room to the motivated regulator. Some recent recalls call into question whether the substantial product hazard" standard is being observed at all. Case 1: Cadmium jewelry. It is accepted that cadmium has been used in jewelry for decades, although not widely. Nevertheless, to my knowledge, there has never been a reported case of "cadmium poisoning" from jewelry. Pediatricians have virtually no awareness of cadmium poisoning as a health threat. The low probability of childhood injury from cadmium in children's products is also evidenced by the CPSC's lack of data on the health impact of ingesting cadmium in this form - it never came up until the Associated Press sounded the "alarm". The available data on cadmium relates only to workplace exposure or airborne cadmium. It is equally well-accepted that children inappropriately mouth jewelry. It is also known that children can and do swallow jewelry, which happens thousands of times each year. No child thinks jewelry is food - but these things happen. Cadmium is in (some) children's jewelry. Kids are known to mouth and/or swallow jewelry. Cadmium is a dangerous metal and can be harmful if swallowed. So, does this mean that cadmium in jewelry a "substantial product hazard"? Given that there has NEVER been a reported case of injury, it is hard to describe the risk of "severe" or even "substantial". It is best described as "possible". Yet, the CPSC has recalled cadmium jewelry three times now. Unfortunately, the CPSC has chosen to respond to the stimulus of newspaper headlines and the ill-informed action of state legislatures, rather than the discipline imposed by its own statutory legal standard. By labeling this hazard "substantial", the CPSC creates many problems that could have lasting impact on the market. It imposes high costs on the industry for something that may not matter much, dilutes the impact of recalls of more dangerous products (have you noticed that the pace of recalls has really picked up at the agency - does that help or hurt the CPSC's mission? ), and diverts the resources and attention of the CPSC staff away from larger and more pressing issues. Perhaps worst of all, contrary to the assertions of Inez Tenenbaum, the confidence of the marketplace is being eroded by the deluge of recalls. Who can you trust anymore? Is the message that you can only trust Mother Government? If so, is Mother Government planning to take over the manufacturing of all children's products next? No one will have enough capital to survive this style of "regulating" for much longer so they better get ready to take over. This is no market stimulus program. Case 2: Dart Guns. I am in the educational toy business and have children of my own. So I am prejudiced - I have no idea why anyone makes toys of this nature. Our company certainly doesn't, and we never allowed them in our home either. However, in our society, guns and dart guns have a certain appeal and they apparently sell well. Family Dollar Stores sold 1.8 million units of a small dart gun set for $1.50 in recent years (pictured above). It looks pretty generic to me, and for $1.50, it is clearly a cheap, disposable novelty toy. Sadly, two boys (9 and 10 years old, respectively) died in separate incidents in which they were chewing on these darts and aspirated them. The dart suction cup blocked their airways, leading to tragedy. 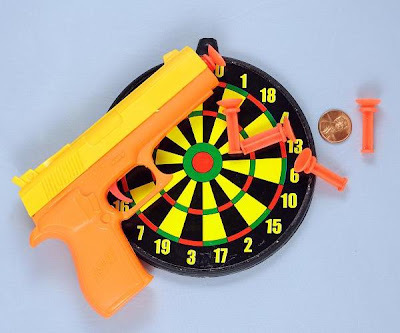 These terrible accidents are sad confirmation of the unnecessary risk posed by dart guns as toys. But do these circumstances meet the "substantial product hazard" standard? If they don't, how can the CPSC recall this item? My argument is that while this toy is very objectionable and apparently capable of harming children, I do not know if it rises to the level of a "substantial" product hazard just because of the two accidental deaths (especially in light of 1.8 million sets sold, plus many millions more of similar items already in the market presenting the same "risk"). The statute does not provide that deaths automatically constitute substantial product hazards. Presumably, if that's what Congress meant, it might have said so. The tragic accidents occurred when two children were doing something they shouldn't. They were also at an age where they were supposed to know better. That doesn't make the loss of these boys any less painful but it does suggest that these incidents were terrible accidents rather than substantial product hazards. It may be that the families' remedies should be in the courts, not via the CPSC. In any event, if we (as a society) don't like dart guns, that's fine - we should ban them. Notably, the CPSC is not taking that position in this case. Recalls cost a lot of money, and it is naive to believe that the market will not respond to an erosion in the legal standard for recalls. Legal standards are an important part of the "rules of the road". If the rules change, the entire game changes. In this case, if we are all exposed to the risk of a massive, multi-year recall of our legal products because of accidents and tragedies arising out of misuse, we will have to change our business models in ways very disadvantageous to consumers. No one has the profit margin to accommodate these unplanned and random expenses. We have no answer for this business problem - we are not clairvoyant. For small, niche businesses like ours, the erosion of expected legal protections is very scary. These recalls are a gross expansion of capricious government power, no matter how scary cadmium jewelry is or how much we might be angry at dart gun makers. With an increasingly reactive CPSC demanding recalls to meet the expectations of newspaper headlines, randomness is complicating business planning and generally demoralizing the regulated community. I may sound like a broken record, but this style of government is stoking voter anger. We have little recourse over these policies or over the intransigence of the Dems in Congress other than in the voting booth. I, for one, won't forget all this. We need a new sheriff in town. CPSIA - What a Job Program! I have apparently been quoted as "admitting" that the CPSIA is a "job creator". I wonder what kind of person could so profoundly misunderstand, or intentionally misconstrue, my testimony at the April 29 hearing. Even more to the point, I wonder what kind of saps those people think they are fooling. It really insults intelligence, if you ask me. Other than testing companies, plaintiff lawyers and government agencies, it is hard to find a company or industry that thinks the CPSIA will help them employ more people. The law does not create economic activity - just wastes lots and lots of money. Quick aside: I find this remark, even if in made in passing, to be bizarre. Is someone really defending the CPSIA by asserting that it actually benefits the economy? The purpose of the law was never to help companies like ours - if anything, the law was motivated by Congress' absolute malice toward manufacturers of children's products. The volume of data to the contrary is overwhelming. To portray the law as a generous act of economic stimulus is so far removed from truth as to invite the term "Big Lie". Inez Tenenbaum was quoted today attempting a similar act of legerdemain when she contended that markets will be lifted by surging consumer confidence under the CPSC's watchful eye. This recasting of reality is dangerous - if these people ever find anyone they can persuade with nonsense. For those of you who missed it, I noted in my oral testimony at the April 29 hearing that our QC department grew from one to four people. In addition, we have a CPSC Bar attorney on retainer and work with another Washington law firm on other representation matters relating to this mess. This has been taken as my "admission" that the awful CPSIA creates jobs. Yippee, we're saved! I write this blog myself. No CPSIA jobs there, unfortunately. I testified that our company's testing costs increased 8x because of the CPSIA, with the prospect of another 3x increase to come after the CPSC lifts its testing stay in 2011. [I get lightheaded at this thought.] We have also seen sharp increases in QC personnel costs plus other frictional operational costs relating to safety under the new law. It's ugly. We estimate the total annual cost increase SO FAR to be $450,000 for our company. This money has to come from somewhere. We are unable to increase our selling prices in a recession, yet the costs must be recouped. Guess how we did it. Our headcount records speak to the stimulative effect of the CPSIA. As of July 31, 2008, immediately prior to passage of the CPSIA on August 14, 2008, LR employed a total of 162 full-time team members. After only four months of magical CPSIA job creation, the ranks of our employees fell to 145 by December 31, 2008. By year end 2009, our headcount had shrunk by one more, to 144 people. As of March 31 of this year, after almost 20 months of CPSIA fun and games, we had 141 employees. At least our QC department is growing . . . . I will freely admit that we are probably creating jobs galore in China where we do all of our product testing. It's too expensive to test in this country. The reported 8x increase in our testing costs reflects our intense effort to control costs. I have no idea how many jobs our testing created in China. Nonetheless, I am sure Mr. Waxman's handiwork is stimulating the Shenzhen region nicely. So is it really fair to say that I "admitted" that the CPSIA creates jobs? I don't mind being misquoted or even to have my testimony under oath twisted beyond recognition. It's not a problem for two reasons - first, no one is being fooled, and second, the truth is obvious in this case. So guys, if it helps you to misquote me or to attribute absurd "admissions" to me, go ahead. Everyone knows how "stimulative" this law has been. Our Casualties of the Week have documented business deaths attributable to this law for months. The HTA put a list of victims of the law into the record for the April 29 hearing. I have published over 400 blogposts that add measurably to the data on the costs and consequences of this awful law. The truth is well-known. And the people who twist it are also well-known. And their efforts won't soon be forgotten - especially when we go to the voting booth in November. Can't wait! At a mere 396 pages, this week's new rules increases the total paper released in the last 45 days to at least 1,004 pages. In its usual helpful fashion, the agency issued these rules to replace other documents recently released and that you may have already read. Gotta read these pupies from the top, since they aren't redlined against prior drafts. This doubles the fun of the new rules - you need to master them to run your business PLUS you get to go on an exciting treasure hunt as you try to figure out what has changed! And we get all that fun for free! Good thing time grows on trees or else I might get frustrated. Happy reading! Just remember, if you don't comment on these rules and the CPSC imposes final rules that are unreasonable or crush your business, you will have no one to blame but yourself. As I said, happy reading! Let's be clear about something - this is pure opinion. It may sound like fact, but there's nothing factual about that self-justifying remark. I am not aware of ANY data to support this point of view. I believe the tenor of Ms. Tenenbaum's remark is that she knows what's best for our markets, namely a lot more regulation. I thought her job was to make people safe . . . . She apparently contends that the market for children's products was sinking under the weight of declining consumer confidence and the CPSIA was some sort of stimulus bill intended to save our market with lots of confidence-restoring regulations. That is a pretty rosy reconstruction of the CPSIA, don't you think? I love a good work of fiction! I have a message for our overlords in Washington - thanks for all your help but frankly, I would prefer to run my business without your assistance. We know our customers, our suppliers, our products and most definitely, our markets - and you do NOT. You say our market needs a boost of consumer confidence. I say that if it does, we'll take care of it ourselves. You have no right to enter our market and tell us how to run our businesses more successfully. That's the ultimate in regulatory arrogance and is completely contrary to the capitalist system prevailing in this country. We are the efficient capital allocators, not YOU. This is all Washington "spin". The noxious regulations choking our businesses are indefensible for their safety impact so now our regulators are telling us the new rules have been designed to be GOOD for our markets. Pass me a barf bag. "Finally, we hope to settle any confusion regarding our intent in endorsing the CPSEA. We endorsed it as our only available alternative. We truly believe that many of our members will be forced out of business after February 10, 2011 without meaningful, clear reform provided by your committee." Thanks, Congress and CPSC, for boosting our markets so well with all your new regulations. It's a brave new world for all of us. Yippee. CPSIA - Has Congress Ever Done This Before? Ha! The CPSIA was crafted as a response to a then-shocking but rather inconsequential series of toy recalls in 2007/8 (very few injuries or deaths). After years of intentionally starving the CPSC of budgetary resources, Congress blamed the agency for the large scale toy recalls, leaped to the conclusion that children's products (not just toys) weren't "safe" anymore and proceeded to gut the law governing safety and the CPSC (the CPSA). The resulting law (the CPSIA) upended regulation of children's product safety across an unprecedented array of industries. "Unintended consequences" popped up everywhere almost immediately. Many people claimed to be "surprised". Given the low injury statistics across the category, the law seems like a vast overreaction. It's easy to overlook historical precedent during a crisis. Has Congress ever missed the boat like this before? Okay, dumb question. But well put! Consider the response to the Titanic tragedy in 1912. In that famous collision with an iceberg, 829 passengers and 694 crew died when the Titanic sank in the Atlantic. Perhaps you recall the movie . . . . Anyhow, it turns out that the Titanic did not carry enough lifeboats to save everyone. There were 2,228 people on board but the lifeboats only held 1,178. Don't doubt my math but 705 survived. Congress couldn't stand still after the Titanic. Pinning the blame for the loss of life on the lifeboats, rather than the iceberg, Congress passed the La Follette Seamen's Act of 1915 mandating boats and life rafts for all persons on board seafaring ships. The thinking goes that if every ship had a life boat seat for every passenger, no one would ever die in such a tragedy in the future. The public furor over the loss of the Titanic prevented consideration of the fact that most ships have no risk of colliding with icebergs because of their routes. Likewise, lifeboats are an ineffective remedy in many marine disasters because they would not be able to be launched. No matter, Congress "solved" the problem. Notably, some members of the maritime industry resisted. In Congressional testimony, A. A. Schantz of the Detroit & Cleveland Navigation Co. noted that the rules intended for the high seas would backfire on the Great Lakes. Schantz pointed out that the light draft and ship design would make Great Lakes ships top-heavy and unseaworthy under the new law. He went so far as to predict that some Great Lakes ships would "turn turtle" if forced to operate with the heavy and useless lifeboats. His argument wasn't just that the expense was pointless - he also noted that it was counter-productive and even dangerous. Let's pause for a second here. Congress rushes onto the field to "solve" a problem it doesn't really understand. Why doesn't Congress understand the problem despite hearings and so on? Well, among other things, Congress lacked industry-specific know-how and expertise. It is better at identifying "effect" than "cause", and therein lies the problem. Consequently, Congress was looking for a particular answer, and tended to reject discordant data (like Mr. Schantz). When industry tried to advise Congress of the inadequacy of its solution, Congress knew better and brushed them off. After all, who has more integrity, Congress or the industry that "caused" the problem in the first place? Can anyone guess where this is going? On July 15, 1915, while at dock in the Chicago River, the S.S. Eastland capsized, killing 844 passengers and crew waiting to cruise on holiday to Michigan City, Indiana. The reason? The Eastland was already top-heavy and became unstable under the federally-mandated safety equipment. The ship, when it listed and sank, was described as rolling over "as though it were a whale going to take a nap". Quite an image. Quite a tragedy. Thanks for all the help, Congress! Not only is this story creepily similar to the CPSIA saga, it is also a reminder of the risks in the broad financial reforms currently being contemplated by this Congress. Senator Judd Gregg warned: "We shouldn't put in place a regulatory regime that overly reacts and, as a result, significantly dampens our capacity to have the most vibrant capital and credit markets in the world." He might as well be speaking of our friend, the CPSIA. As Jim Grant notes: "The intended consequences of government regulations are frequently less potent than the unintended ones." As obvious as Mr. Grant's point has become in the case of the CPSIA, the Democrats if anything have hardened their position and remain resolute that they are doing "everything they can" for us. Put another way, everything else that we want (and which has been denied us) in a CPSIA amendment is NOT forthcoming. No reason supplied except the intellectual pap that everyone wants kids to be safe - America demands it. Apparently, the Dems think they have a much better idea on how to keep kids safe than the industry. So the Democrats are willing to risk another S.S. Eastland in the children's product industry rather than admit they went (way) too far. The Republicans, to their undying credit, admit that the CPSIA needs severe restructuring and are working hard to bring about real change. Sadly, Waxman and his Dem co-horts are able to block the Republican effort at reform, and that's why we are in a stalemate. Who will be the S.S. Eastland of the children's product industry? It could be my company, could be your company, could be your school or even your child. The unintended consequences keep coming to light, and as the evidence mounts, the Democrats in Congress and their counterparts at the CPSC will held to account for the damage they have wrought. History will not forget. CPSIA - Richmond Times-Dispatch Editorial "REGULATION: Protection Racket"
We live in the safest society in world history, Michael Crichton observed in State of Fear, yet Americans seem to go about their day in abject terror of minuscule threats. Perhaps nowhere is this more apparent than in Washington's approach to child safety. At the instigation of the American Academy of Pediatrics, federal bureaucrats at the FDA, the Department of Agriculture, and the Consumer Product Safety Commission are studying whether to require the nation's hot-dog makers to redesign hot dogs to reduce the likelihood of choking. Choking is a serious hazard -- about 15,000 children receive medical attention each year because of it. But children choke on a wide range of items, from candy and gum to balloons and small change. In 2006, only 61 choking deaths were food-related, and hot dogs accounted for only 13 of those. Any child death is tragic. Yet it's worth noting, as The Washington Times did not long ago, that children under age 10 eat almost 2 billion -- yes, 2 billion -- hot dogs a year. On a per-hot-dog basis, the odds of a child choking to death are 13 divided by 2 billion, which comes to . . . well, a microscopically small number. The odds that a person will be struck by lightning in any given year are about 4,000 times higher than the odds of a child choking to death on a hot dog. Given that context, redesigning hot dogs looks like a solution in search of a problem. But it's not just hot dogs. The Consumer Product Safety Commission also has sounded the alarm about baby slings, which have enjoyed a recent surge in popularity because the close physical contact allows for greater parent-child bonding. In extremely rare instances, children can slip out of the slings or smother in them. The CPSC says slings are responsible for as many as 13 deaths -- in the past two decades. The CPSC also has announced the recall of 1.2 million high chairs. No deaths have been attributed to the high chairs, but the agency says they do pose a fall hazard because screws securing the front legs of the chairs can loosen and fall out. Earlier this year the CPSC announced a recall of more than a half-million drop-side cribs because of "31 . . . incidents. In six of those incidents children were entrapped between the drop side and crib mattress. Three children suffered from bruises as a result of the entrapment." Of course it is possible to understate hazards that can endanger children, epecially young children. But if it is possible to understate the hazards, then it also is possible to overstate them. Context and perspective matter. If the regulatory state has reached a point at which it is warning about the dangers of patently safe products, then the public might reasonably wonder what, exactly, is being protected -- the health of young children, or the jobs of federal employees? CPSIA - So What's the Problem? New CPSIA Product Ideas. This bike is made of pure titanium - no lead! Something cute for the nursery? Be sure to ask for the GCC! "Safe Sleep" initiative candidate. Just watch out for the sharp points. Thank you again for the opportunity to testify before your committee and for your continued attention to the needs of our small businesses. We would like to reiterate our position on the CPSEA and the relief we are seeking for our members. We have previously endorsed the CPSEA because it is the only opportunity currently available to save small batch manufacturers from extinction after February 10, 2011, when the CPSC's stay of enforcement of third party testing requirements expires. Under the CPSIA as it currently stands, many of our members are substantially limiting the products that they offer--some foregoing children’s products altogether--while others are laying off employees or limiting their business growth. We have stated clearly that the CPSEA can and should be improved to reduce unnecessary regulatory burdens on small businesses without compromising safety. The CPSEA as currently written will likely save some of our member businesses. With improvements, however, you can save almost all of them. For the record, we would like to review the improvements we would like you to consider. This language should be in the bill itself, not just in the report language. In the intervening days since our initial endorsement of the CPSEA, we have heard conflicting answers from several different CPSC commissioners as to the commission's willingness or ability to provide affordable alternative testing methods for small batch manufacturers. If this bill is truly meant to benefit small batch manufacturers, it must be more clear and explicit in the exemptions it provides. Second, we wish to reiterate our belief that alternative testing methods should be available to all companies. The Small Business Administration defines toy and clothing manufacturers with less than 500 employees as small businesses, which is far in excess of the CPSEA's $1 million limit. If a revenue limit is used, it should be based only on income generated by the manufacture or importation of children's products without including other unrelated business income. A manufacturer's ability to pay for testing any given product is a function of the revenue it generates from that particular product, not the overall size of the company. Third, we stated publicly during the April 29 hearing that the functional purpose exemption for products exceeding 300ppm/100ppm lead will not benefit our members because of the narrow scope of the exemption and the cost required to obtain it. The CPSC should instead be given authority to make exemptions to specific materials or product categories based on risk analysis. For example, the commission should have the power to exempt brass as a material and children's saddles or microscopes as a product category. This is the only way in which small businesses would be able to take advantage of the functional purpose exemption. Fourth, we believe that small batch manufacturers should be entirely exempted from mandatory labeling requirements. Finally, we hope to settle any confusion regarding our intent in endorsing the CPSEA. We endorsed it as our only available alternative. We truly believe that many of our members will be forced out of business after February 10, 2011 without meaningful, clear reform provided by your committee. We believe that the CPSEA can and should be improved to better target risk and provide more comprehensive relief for our members, who were never the source of unsafe products in the first place. We remain hopeful that the democratic process can prevail and that a meaningful and bipartisan reform of the CPSIA can be enacted. We urge members of the committee to mark up the CPSEA and allow open discussion within the product safety subcommittee. The CPSIA was a bipartisan bill—its reform should be, too. You hold the livelihoods of hundreds of small businesses in your hands. Please, make this work. On behalf of the 435 small business members of the Handmade Toy Alliance, we thank you again for your attention to this important issue. I have a new legal standard for the CPSC in its continuing effort to make everyone so, so, SOOOO safe: the "Lowest Common Neurosis". Under this innovative legal standard, our safety agency would reset its legal standards and reissue 2500 pages of rules every time a ridiculous news article appears touting a poorly-conceived, made-up phobia relating to children's products. There are so many examples to think of, from cadmium jewelry (thanks, AP!) to Zhu Zhu Pets with lethal noses to the latest craze, making hourly employees at the checkout counter cough up General Conformity Certificates on the spot. Hadn't heard of that one yet? This is the latest craze sweeping the nation, thoughtfully brought to our attention by the Dallas CBS affiliate on May 10. Their report begins ominously: "Mindee Haas buys plenty of toys for her 15-month-old daughter Sophia. Haas, 33, says she usually trusts those toys are safe, but her trust is fading after a recent run of toy recalls." Ah, the "recent run of toy recalls". And those were what, precisely??? I think the crack CBS "investigator" is referring to the recalls in 2007/8. They certainly couldn't be referring to recent recalls because toy recall rates have fallen precipitously. According to data from the CPSC website, there have been a grand total of nine recalls through April 15 of this year (one alleged injury, from laceration) and only 32 in 2009 (20 alleged injuries and one death, none from lead). This is very low by historical standards. Of the 3 billion toys estimated sold per year in our country, only 4,530,860 were recalled in 2009 over 32 recalls. The total units recalled this year is 888,680 through April 15. This amounts to a recall of approximately 1 in 1,000 toys sold (in other words, 99.9% toys were NOT recalled in 2009/10). I guess a crisis is whatever CBS Dallas says it is. Apparently not satisfied with creating a scare about imaginary recalls, the CBS affiliate continues to intone, quoting the mom: "'I don't want [my daughter] to be a lab rat at home,' said Haas 'There are so many things in toys these days that we just don't know the effects of them long term and that's what's scary.' Toy after toy has been yanked off the shelves deemed unsafe for children." To "investigate", CBS decided to find evidence of toy safety. They chose the low budget route and opted to NOT test toys, perhaps fearing that the toys would pass (and then what would they be able to say?). Instead, Matahari-like, "CBS 11 News went undercover inside the most popular toy stores to see if they had the certificates for their toys." "Employees at both stores and even a manager said this was the first time they heard about safety certificates. 'I have a guest who's wanting to buy a toy she says she was told that you can get a certificate printed out something that says there's been a lead recall or not,' asked a Target employee 'It shows if the toy has been tested for lead.' We waited as the employee got an answer from her manager, 'Do you know anything about that?' Manager: 'No I have never heard that we don't have certificate.'" Incredibly, the checkout person at Babies R Us and Toys R Us also did not have a copy of the company's safety files right there for inspection. Whoa! CBS was able to get some great insights on the problem from a SMU Marketing professor. He thinks the stores are blowing it. "'Not only is it important to have [the GCCs], but you could use [the certificates] to market your store,' explained [Dan] Howard 'You could advertise the fact that we have it!' When asked how difficult he thought it was to simply know about the certificates Howard responded 'Not difficult at all!'" Dan Howard says it's not difficult at all to have checkout counter access to GCCs at Target, TRU and all other U.S. retail outlets for children's products. Well that settles it! I sense a new rule a-comin'! And how does Mom feel about the CBS findings? I think she articulates our new Lowest Common Neurosis rather well: "'Just not knowing if the companies are being responsible enough to know what's in their products that's what's concerning,'" said Haas. She says she will stick to going to her mom and pop shops for the time being." Anyone want to kick in for a national Xanax fund? Labels: Cadmium, GCCs, Humor, Mass Market Companies, News Reports, Testing, Who Can You Trust? The Democrats' stonewall over the Waxman CPSIA Amendment continues unabated after the April 29th hearing. Do you think they were humming loudly while I gave testimony??? "[Here] is the list of 'targeted areas' we sent last Tuesday [to Waxman's staff]. This is by no means a comprehensive list of topics we would like to eventually address, but it is the list of areas in which it may be possible to find compromise and that would greatly expand the sphere of relief to affected businesses of your size. To date, I am unaware of a response." No response from Waxman. I guess this really isn't a big deal, huh? "I want to emphasize to you how important a legislative fix is for Mr. Barton – he is not being 'obstructionist'. Over the last 18 months we sent numerous letters and verbal requests for a hearing at which people could share how CPSIA impacted their businesses and to hear suggestions on the best way to address the problems created by CPSIA. Those requests were sometimes ignored but always rebuffed until 2 weeks ago. Additionally, Mr. Barton and most of the E&C minority introduced a fix bill in March 2009, which the Majority refused to even discuss, let alone mark up. The Majority finally met with us in January to discuss CPSIA. At that meeting, we discussed those areas we believed needed to be addressed. We were told we had to work within the four corners of their legislative language. We acquiesced in an effort to see something accomplished and proceeded to discuss only ways to improve their proposed language. All of our requests, other than the concept of small business relief (I say 'concept' because we never discussed details, only that such relief would be necessary), were denied." The Dems' fantastic accusation of Republican obstruction is meant to sucker you into believing that the Dems are your "friend" and the Republicans (notably Mr. Barton) are holding the democratic process hostage. This is certainly untrue on both accounts. The Dems hold a 13-seat majority on the House Energy and Commerce Committee and have demonstrated time and again their ability to pass bills without Republican support (think health care). The Republicans would LOVE IT if they had the capacity to obstruct . . . but they don't. Unless you think the Waxman Amendment and its utter disregard of your pain is some sort of gift, the notion of Dems' as "friend" does not compute. I want to reiterate that there are NO alternative testing methods known to the CPSC that would assure compliance. NONE, ZIPPO, NADA. It's a scam that the Dems persist in propogating. The issue about legal challenge is yet another huge worry for those businesses dependent on REAL relief. It is a relief to know SOMEONE is concerned to make sure you and I aren't left out in the cold. I think this bold political stance is downright heroic. Having fought basically full-time for 18 months, I have become accustomed to the cold shoulder from Democrats, as though I was some kind of criminal or some other kind of societal scum. Actually, I make educational products with a remarkable record of safety and compliance with law. The support from Barton and the Republicans is literally a godsend. The Republican list of "asks" is not perfect, but it is practical and has good potential to help. It's not the optimal list, which they acknowledge, but it is a starting point for fixing a terrible law. The list is below for your review. The Republicans deserve your support. They have also earned my thanks. With people like Joe Barton in the mix, there still is hope of real relief . . . someday. Henry Waxman, where are you? "· Insert legislative language permitting the CPSC to grant exceptions for entire product categories. Current language permits exception for “a specific product or material” but does not permit the exclusion of an entire category (e.g., science equipment for schools, bikes, motorized recreation vehicles, or brass musical instruments). · Direct the CPSC to act sua sponte to exclude categories of products based on least risk. E.g., leather saddles, golf clubs, microscopes or other science equipment, children’s ball point pens, musical instruments, etc. Timeline should be no later than the end of FY 2010 due to the February 2011 expiration of the stay on testing and certification. CPSC must also issue a notice of those products it will initially review for such exception. · If the CPSC reviews a specific product petition and chooses to grant the petition, require the CPSC to grant a product category-wide exclusion unless significant safety concerns exist. · Remove the ability to provide an expiration date on exclusions. If a product is proven to have no measurable adverse impact, it should be permitted for sale. Manufacturers require certainty for both the initial investment in a petition (estimates range from $25,000 to $50,000 per). · Permit any “alternative testing” schemes blessed by CPSC to be used by any business. Alternatively, increase the size of businesses defined as “small batch manufacturers” under the bill. · New standards added to the F-963 toy standard should, as a default, not be subject to [Third Party Testing]. The CPSC should have the discretionary authority to mandate either [Third Party Testing] or alternative testing methods, however. · Eliminate the first two prongs of the exclusion standard. If an item is proven to have no measurable adverse impact (third prong), it will not matter if the item is designed to be/can be put in a child’s mouth (second prong), or if the item requires lead for a functional purpose (first prong)." One of my great frustrations with the CPSIA is its presumption that all children's product manufacturers are identical and none can be trusted to operate responsibly without vigorous government oversight. The CPSC, under the direction of the CPSIA and Congressional zealots from the Democratic Party, are developing identical safety and business administration processes for all businesses making children's products, notwithstanding an absence of data confirming hazards (think books, bikes, ATVs, pens, educational products). This lowest common denominator approach is one of the main sources of increased expense for businesses like ours. And, unfortunately, this offense of government intrusiveness adds no value to our safety efforts despite the self-congratulations of the Democrats leading the charge in Congress and at the CPSC. Why don't I want to be like everyone else? Why don't I want the government to tell me how to run my business "better"? Of course, the CPSC has absolutely no idea how to effectively operate our business. Even more importantly, the CPSC's voluminous new rules misappropriate the value of our innovations and know-how. We taught ourselves how to efficiently assure the quality of our products - that's how we achieved our enviable safety record over a quarter century. The fact that we can do it at a low cost does not make us bad people - this is an economic advantage we should be entitled to capture and use. The CPSC has written rules to take that advantage away. This policy is un-American and profounding anti-small business. We are no longer able to compete with larger companies by being smarter or fleeter-of-foot. By making everyone "equal" (forcing adoption of government-designed and government-approved procedures), Democrats like Inez Tenenbaum and Bob Adler now prohibit our company from prospering from hard work, innovation and investment in productivity and efficiency. The Dems' justification is that they know what's best for us and for all American consumers. Other than bravado, this assertion has no basis in fact. Even the very existence of the "crisis" they seek to avert (with our money) is very much in doubt. If I am wrong, someone should show me DATA to prove it. The CPSC seems eager to be our industry's U.S. Handicapper General, driven by the CPSIA and the Waxmanis. In "Harrison Bergeron", all individuality has been eradicated by law. Those who by the grace of G-d or through their own efforts crafted some form of advantage were reduced to the lowest common denominator by the H-G. Resentment of successful people is called the Tall Poppy Syndrome in some countries. Ironically, people in the U.S. tend to admire the successful and seek to emulate them. The CPSIA takes an opposite tack - Mother Government knows best and safety innovation must be illegal. We need "standards". The Tall Poppies can't be trusted. I hate to feel like Harrison Bergeron. The bad feelings sting all the worse because I know that the "crisis" is imaginary and has been coopted for political and populist advantage. This is an awful justification for destroying our lives' work. Even more demoralizing, we have already proven our expertise in supply chain management and quality control/compliance over many years. No matter. The CPSC knows best. Something's VERY wrong here. Is it any wonder that there is anti-incumbency rage in this country now? I have received a lot of feedback on my data on injuries from lead since I published it on Thursday. Some of the comments deserve further exploration. a. Did anyone have this data previously? I think the answer is NO. I have heard from inside the CPSC that this kind of data analysis is not being done. The data is nowhere to be found, except here. Recent testimony by consumer advocates and Congressional zealots is strangely bereft of details, just long on invective. Don't we deserve better? The hysteria over lead-in-paint recalls, combined with other recalls that were unrelated created such a lynch mob atmosphere in Congress that the only data that registered was data that supported the mob's POV. The actual data is therefore something of a surprise. Let's look at the four reported lead injuries for a moment. The one death from lead, the famous incident in Minnesota where Jarnell Brown swallowed a lead charm off a Reebok bracelet, is well-known. Injury no. 1: L.M. Becker recall (vending machine jewelry, Sept. 10, 2003): "The firm received one report of a child who swallowed the necklace's pendant, which reportedly resulted in high blood lead levels." Injury no. 2: Four company recall (vending machine jewelry, July 8, 2004): "CPSC has received one report of lead poisoning when a child swallowed a piece of toy jewelry containing lead that was previously recalled. No reports of injury or illness have been received for the recalled products announced today." THIS REFERS TO THE L.M. BECKER "INJURY" ABOVE. Injury no. 3: Munrie Furniture, Inc. (cribs and matching furniture, December 23, 2008): "Munrie has received one report of a child ingesting the paint. The child was diagnosed with lead poisoning." Injury no. 4: Allreds Design (bracelets and clips, February 17, 2010): "Allreds Design received one report of a 10-month-old child who was treated by a physician for elevated lead levels." Do these three injuries (one injury is double-counted) have anything in common? I assert that causation is not proven in these cases. Yes, lead poisoning is alleged, however there is no evidence that the cause has been determined definitively. READ what the CPSC said - the connection to the defective children's product is loose or even conjectural ("reportedly resulted in high blood lead levels"). Remember car seats that gave kids lead poisoning? Toxic car seats were a hoax. The injury data is flimsy at best. And this is all the evidence there is of injury from lead in children's products in the last 11 years of recalls. The Democrats and consumer groups would rather eat broken glass that admit that the lead poisoning scare is a hoax. They want to run our businesses - so there's no conceding that all this economic damage cannot be traced to anything other than ONE TRAGIC ACCIDENT IN AN ELEVEN YEAR PERIOD. Uno, that's it, in our country of 300 million where thousands of kids die every year for various reasons. Well, at least we know our companies will die in a valiant cause, to reduce the ten-year death rate from lead in children's products from one to zero . . . .
b. Was the CPSC really broken? This is Mr. Waxman's assertion, as expressed in his opening remarks at the April 29 hearing. So it must be true, right? "Yet while the CPSC has never been more vital, through much of its 33-year history the agency has been chronically understaffed and underfunded. Overseeing 400 recalls a year, most at companies' requests, the CPSC's compliance team has less time to initiate its own investigations, which tend to reveal the most serious risks. . . . Growing workload and shrinking resources have left many disheartened. From a peak of nearly 1,000 in 1980, CPSC's head count has fallen to 400. . . . What can be done to help the agency? In a word, money. It's been 17 years since Congress thoroughly reviewed the CPSC's resources and needs, says Nord." So, let's see, Congress has been tightfisted with budgets for this little agency for many years, starving it of needed resources and headcount, effectively shrinking it over a 17-year period to a withered state, and then after an outbreak of large-scale toy recalls (by and large injury-free), Congress blames the agency for inattention to its mission and severely rewrites the law to punish the marketplace and the agency itself. After all, why blame the entity responsible for the problem in the first place, Congress? Much easier to blame the agency! c. Wow, those were a LOT of recalls? Is that the tip of the iceberg? As far as I can tell, the answer is that most of the iceberg is a mirage. Experienced CPSC hands note that the recall notices are prepared by the press office at the CPSC and are meant to attract attention and headlines. Big numbers, if defensible, are best suited to demonstrate that the cop is on the beat. A few tricks of the trade is to add in as many sources of "recalled" items as possible. I believe that as many as 60% (that's no typo) of all recalled units NEVER WERE SOLD. I would simply observe that if they were never sold, they never had the potential to cause injury. Second, the population of recalled items is always inflated out of an abundance of caution whenever there is ANY doubt as to the identity of dangerous products. In other words, if a company sold one bad lot but also sold nine good lots, all indistinguishable, the recall would be announced for all ten lots, even though there is NO dispute that nine of the lots are absolutely fine. Without this insight, recall statistics might be alarming, at least in a sense. Actually, the recalls are something of a mirage, an illusion of legions of bad products that really don't exist or were never sold. How can we verify this? Among other things, injury statistics back up this assertion. If we had 300 million units of dangerous products in circulation, the injury statistics of 2381 injuries in 11 years seems pretty low to me. Assuming an average time in the marketplace of three years per recalled item, this implies an annual injury rate of 0.026% (from all causes, not simply lead). If the products are in the market for only one year on average, the annual injury rate is still only 0.077%. In other words, in a worst case scenario, you can safely use RECALLED children's products 99.92% of the time. And you would presumably be even safer with NON-RECALLED products. Think of it this way: There are about 3 billion toys sold in the U.S. annually, according to Alan Hassenfeld, former CEO of Hasbro. Over 11 years, that 33 billion toys. [Considering that "Children's Products" includes far more than just toys, the pool of 11 years of sales is probably north of 500 billion units.] Were you to assume that all 899 recalls in my data were toys, the pool of 308 million units recalled would represent 0.93% of all toys sold in that period. So, if 0.93% is safe 99.92% of the time, and the rest presumably safe at a higher rate (let's say 99.999%), then the blended safety of all toys is 99.99%. The result is probably higher than that. Numbers, numbers, do they matter? We are spending not less than $5.6 billion per annum to "fix" this 99.99%+ safe problem. In an effort to create a much "safer" environment for kids, the helpful folks at the CPSC have produced literally thousands of pages of documents, rules and instructions to govern our businesses down to the tiniest detail. Unfortunately . . . the assertion that anyone will be safer CANNOT be proven as a matter of mathematics. A neurotic bill administered by people who no longer can assess what is and is not safe is a danger to our society. The data proves it. Who should be held accountable? Congress? The Dems? Inez Tenenbaum? Some or all of the above. Tom Fletcher and his business partner Barbara Anderson-Sannes opened The Essence of Nonsense toy store 14 years ago dedicated to selling unique, high-quality toys out of their St, Paul, Minnesota shop. Offering an array of the best handmade toys from small domestic toymakers and traditional European manufacturers, The Essence of Nonsense became an important retail destination in the local community. After the CPSIA imposed new restrictions on the toy industry, Tom and Barbara found that their suppliers greatly reduced the range of products available. Even more disturbing, they also noticed that the quality of products was rapidly deteriorating. Rather than sell inferior quality products, they decided to close the store. This was no “victory” for safety - their store had never experienced a recall of any of its specialized products. "CPSIA cut our choices in half," says Tom Fletcher. "Some small companies stopped selling or disappeared and the bigger companies, realizing they were the only options, started to reduce quality to save money for themselves. So, we decided to close in large part because the quality of our product offering was changing and the choices were becoming so limited." "It's not that we're against the [CPSIA-imposed] testing," Fletcher continued. "It's just that we need a fair application across the board. Small businesses can't afford to hire the necessary testers which puts them at a significant disadvantage and can even put them out of business." Tragically, the closing of The Essence of Nonsense is a cautionary tale about how the overly-restrictive burdens of the new product safety regime can destroy small businesses and imperil their unique products. On the back of a precautionary law, a wave of destruction is carrying away the life’s work of many small businesspeople. "When you pick up a handmade toy," Fletcher says, "you can feel the dedication and effort that went into making it. Someone really loved making that toy. If something isn't done to protect small businesses, handmade toys will be gone soon. People will look back and say, 'we had this when I was a kid and we don't have it anymore.'"